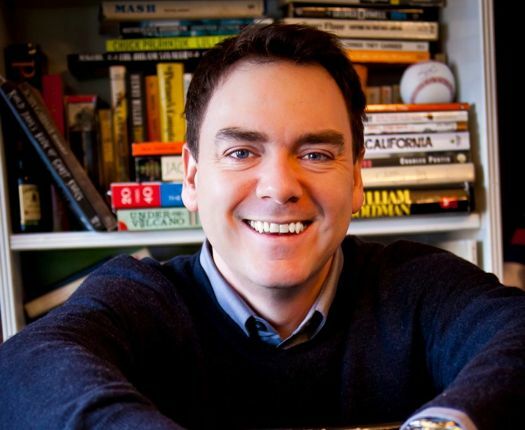 About twelve years ago, on Labor Day weekend, Chris Millis sat down in his Saratoga Springs home to write his first novel -- in three days. The attempt was part of the 23rd annual International 3-Day Novel Contest. "I wanted to do it for a long time, and my wife went away for three days, so I decided I'd try." He spent the entire week before mapping out an outline, which was allowed under contest rules. But when he sat down with his legal pad to begin writing, he threw the outline away and started writing an entirely new story. "I just wrote it off my head," he says. "I said I'm just going to start with a guy who gets into trouble and see if I can get him out of trouble." The book he ended up writing, Small Apartments, won the contest. It was published, and eventually the story was optioned for a film. Millis wrote the screenplay. 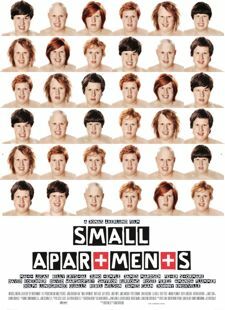 The resulting film -- also called Small Apartments -- was directed by Jonas Akerlund and stars Matt Lucas (Bridesmaids), Billy Crystal, Juno Temple, Rebel Wilson, James Marsden, James Caan, Rosie Perez and a bunch of other actors you'd recognize. The film premiered at SXSW last year, went into limited theatrical release earlier this month, and this week was released on DVD. Next week, the film will screen in Saratoga. Chris Millis never thought he'd be a writer. He started out as a cartoonist. "I'd never really written anything before," he says. "I wrote sports for The Saratogian and for a newspaper briefly. I thought I'd be a political cartoonist." He worked with John McPherson on the comic strip Close to Home. "I think I worked a lot harder finding my cartooning voice than I ever did as a writer. I don't know why it happened that way. I think I was lucky to find my voice as a writer so quickly." After Small Apartments won the novel contest and was published, Millis decided to get an MFA in creative writing at Goddard College. One of his professors was Neil Landau, who wrote the screenplay for Don't Tell Mom the Babysitter's Dead. "He's brilliant at structure and I met him at the perfect time in my life," -- as he was about to rework the screenplay for Small Apartments. "A friend lets me write at his cabin in Lake Placid. I went up there with the screenplay for Sideways -- I thought it had a great structure. Later it won an Academy Award, so I guess I picked the right screenplay to take with me." Millis says Small Apartments is about "a lonely guy named Franklin Franklin who kills his landlord and tries to get away with it while avoiding his nosy neighbors. What he dreams about is going to Switzerland - it's this Utopia to him. It's a funny story but it's also beautiful." Here's a review from The Hollywood reporter. And here's another trailer, the director's cut (that preview is not office friendly, so put on your headphones). So yep, in the the last twelve years, Chris Millis has had a few "Wait a minute... what? Really?" moments. Winning the contest, optioning his story, writing a screenplay, and finding and working with an impressive cast. "I kept going 'What? OK. Billy Crystal is going to play Burt Walnut? Really? OK..."
On the set when Millis wandered over to Crystal, he asked what drew Crystal to the film. "He said, 'I don't know... I just read the script. You write good kid. You're funny.'" In addition to its star-studded cast, Small Apartments includes a somewhat lesser known actor: Millis' high school buddy Scott Sheldon. "He was our high school class president. He's hilarious," says Millis. 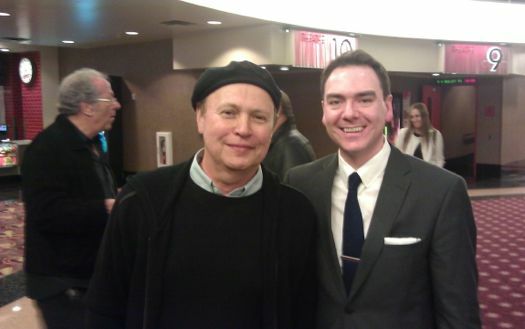 At the Saratoga premiere on March 1, the film is being introduced by another friend, former history teacher and high school class advisor Dave Patterson. And none of this is at all surprising once you talk to Millis, a seventh-generation Saratogian with a deep love for his city. "There's a great sense of community in Saratoga, and of all the travel I've done -- overseas and everything -- I've never found a town I like more than Saratoga." Since Small Apartments, Millis has been working on developing some other indie films with "some interesting directors and stars attached," and he's also been doing some celebrity ghost writing. His second novel, which he took a couple of years to write -- God and California -- is due out this spring. He describes it as, "The story of a defrocked Catholic priest and and wounded Iraq war vet who travel across the country in a pink Cadillac breaking the ten commandments in order to provoke a conversation with god." God and California has already been optioned by Lionsgate Films and Goran Dukic has been tapped to direct. Between a three-day writing contest and a film premiere at SXSW there were a lot of lessons -- from finding agents to forming relationships to getting a cast. "To live this kind of artistic life, you're always scrambling and looking to the next thing," says Chris. "One of the things you rarely do is take a moment to enjoy something and give yourself a little recognition for the moment that you've earned. You're never satisfied as a creative artist -- and that just does not compute with enjoying success. How do you actively enjoy something so you are satisfied with the attention you have given it. That is the lesson I'm trying to take heed of now. I'm looking forward to March 1, and I think there's going to be a lot of love in the room." Tickets to the Saratoga Screening of Small Apartments, in the Saratoga Music Hall above City Hall are $7 in advance and $10 at the door. The film is also available through Amazon instant video and Netflix. I think the write for 3 days and sell your first thing and have it made into a movie (that, based on the trailer, looks like something Saunders might write) is a better option. George Saunders is a god. Apparently, Ben Stiller has been trying to get "CivilWarLand in Bad Decline" made for years. I tried to buy a copy of your book from Amazon and they say new copies are $156.31. That seems a little steep. I could understand if it was for hardcover but for paperback I just can't swing that. Is this some sort of plot to force me to buy a Kindle?